RedPort Optimizer and STS SeaMail satellite email service work together to save you time and money – while connecting you to the people and information you need. Optimizer creates a handy WiFi hotspot out of your satellite phone connection, allowing you to connect multiple devices (computers, laptops, smartphones and tablets) up to a single hub. 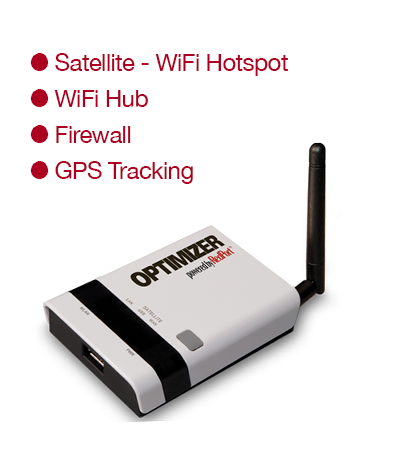 Simply connect Optimizer to your satellite phone or broadband terminal and it will create a WiFi hotspot for your computer, tablet or smartphone. XGate satellite data service works with Optimizer to let you access accelerated email, web browsing, download your favorite weather files, or post to Facebook, Twitter or LinkedIn. Most importantly, you can avoid runaway satellite phone airtime bills thanks to Optimizer’s powerful firewall. Optimizer sold together with STS SeaMail. Learn about STS SeaMail/Inet service [ Here ]. Works with STS SeaMail, web, weather & social media services. Up to 85% savings on satellite airtime. Only 4 x 3 inches, Optimizer is small and light enough to take anywhere. Guaranteed for two years from purchase date, subject to terms and conditions. Optimizer’s built-in firewall blocks all traffic except that carried through STS SeaMail. This means that once the link is established data flows through the pipe at optimum speeds, giving you the best possible transfer rate. Since nothing traverses the router except STS SeaMail, unwanted traffic is eliminated. This prevents surprise airtime bills caused by unmonitored and unwanted background transfers.